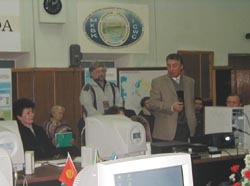 In the regional workshop, held within the framework of the project on December 4-6, 2002 in the ICWC Training Center, the specialists of water organizations, the representatives of power, hydrometeorological and planning ministries and agencies of Central Asian states participated. 1) The results of the analysis of climate change impact on available water resources in Aral Sea basin. 2) The means of reducing the requirements for water and improving water productivity on the example of several regional projects results. 3) The means of reducing common requirements for water resources and providing sustainable development of the region on the basis of collaboration in water management, cooperation in food production and so on in terms of climate change impact. The workshop participants welcomed the presentations and reports, which included the assessment of potential climatic changes and a set of measures to be taken because of possible climatic changes. It was noted that water saving possibility much more exceeds those changes, which can happen in the coming 20 years as a result of climate change impact on water availability and water use. It was especially remarked that the expected climate change can mainly favor agroclimatic conditions improvement, if the appropriate technologies are put into action and favorable conditions are provided for the activity of farmers. Increasing the precision of long-term climatic and hydrological indicators forecasts. In the second part of the workshop, the participants actively discussed the made reports and were shown the project of the Aral Sea Basin Management Model (ASB-MM) complex. 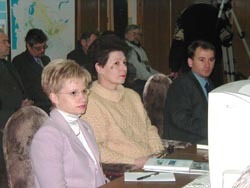 At the workshop the participants were presented general structure, capabilities, objectives and designation of models complex, consisting of Hydrological Model, Socio-Economic Model, Planing Zone Model and the Aral Sea Basin Model. The capabilities of each model and the order of implementing inter-model relations were elucidated in detail. 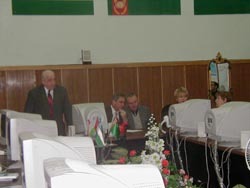 The results of using the models for the optimistic scenario and the scenarios, based on national visions/strategies of prospective development of each state in the Aral Sea basin were demonstrated. At the same time the workshop participants were given the opportunity to independently practice ASB-MM and its components  Socio-Economic, Hydrological and Planning Zone Models. All the participants noted that the last version of ASB-MM, disseminated on CD, was easy to understand and to assimilate, and allowed planning bodies to properly direct Decision-Makers. Questionnaire “Your opinion about possible climate change” was disseminated among the participants. The table with the answers of the workshop participants is given [PDF, 21 kB]. International Workshop aimed to preparation of general report “Dialogue on water and climate” on base of discussions conducted on specific “Dialogues…” in different countries for 3rd World Water Forum was held on 17-18 of December 2002 in Dhaka, Bangladesh. Workshop organizer became Bangladesh Institute of Administration and Management. On the workshop discussion on all national “Dialogues…” were conducted and results of fulfilled researches were generalized.